Maybe I should just turn this blog into Thai recipes only, I feel like I post so many. I can’t help it though, it really is my favorite cuisine. And I’ve lamented so many times in the past that San Antonio just doesn’t have much great Thai food. So I find myself taking matters into my own hands. There is a lot of speculation about why these are called ‘drunken’ noodles when there’s actually no alcohol in the recipe at all! My favorite explanation is that someone, at some point in history, came home drunk and made noodles with whatever they had in the fridge. Because, let’s be honest, these noodles make great drunk food. Or for me, more specifically, great hangover food. After a night of indulging just a tad too much, some spicy noodles or curry with rice is the best hangover cure. Lots of carbs to soak up the booze with protein and spice to kick the lethargy you’re undoubtedly feeling. Don’t worry, we’ve all been there. There’s no shame in needing drunk or hangover food. While you may not have some of these ingredients in your pantry ready to go, a quick trip to the asian market should get you everything you need! I’ve started keeping staples in my pantry like soy sauce, oyster sauce, fish sauce, dark soy, etc. so I can have them if the mood strikes me to throw some thai food together. And if you love spicy food, you can find the recipe for my chili oil here. I keep a jar in the fridge at all times, it’s so good and spicy! The most important part of this dish really is the noodles. As I state in the notes below, you can use dried wide rice noodles if you can’t find fresh but nothing really beats the fresh, chewy noodles you get at the asian market. They really make all the difference in the world. I’ll throw an image in at the bottom of the noodles that you will most commonly find at a well-stocked asian market. This was also my ‘recipe of the week’ on instagram and you can watch it step by step in my highlights here! I swear this recipe is better than take out and it’s worth making the trip to your local asian grocery to get all the ingredients. Happy cooking! To make the sauce: whisk all the ingredients together in a small bowl and set aside. To warm the noodles: If you're using fresh noodles, place them in a microwave safe bowl and cover them with a slightly damp paper towel and microwave them for 2 minutes. They should feel very flexible once you pull them out. Separate the noodles into a bowl and set aside. Whisk together the eggs and soy sauce in a small bowl and set aside. In another bowl, mix the sliced chicken with the cornstarch until all the pieces are coated. Set aside. Heat a large wok or skillet over medium high heat. Add the oil and garlic, and stir constantly for 30 seconds until the garlic is just barely golden brown. Don't walk away because garlic burns really quickly! Once the garlic is just turning golden brown, add the chicken and use a wooden spoon to distribute the chicken in an even layer over the bottom of the pan. Cook, stirring frequently, until the chicken is golden brown. Lower the heat slightly and move the chicken and garlic to one side of the pan. On the exposed side, pour in the egg and soy sauce mixture. Allow the eggs to cook for 2-3 minutes, until set and then break up the eggs into pieces with a spoon and stir everything back together. Add in the onion, bell pepper, jalapeño (if using) and the white/light green parts of the green onion. Cook for 2-3 minutes until the veggies are just starting to soften. Add the noodles to the pan with the sauce, thai basil, dark green parts of the green onion and bamboo shoots. Cook, stirring occasionally until the noodles have absorbed all the sauce. Serve immediately. You can make this recipe with dried wide rice noodles, but it's not quite as good (in my opinion!). Just cook the noodles according to package instructions and rinse them well with cold water. You may want to toss them with a little oil as well to keep them from sticking. Most well-stocked asian markets will have the fresh wide rice noodles sometimes labeled as 'chow fun noodles' or 'banh pho ap chao' depending on the brand. 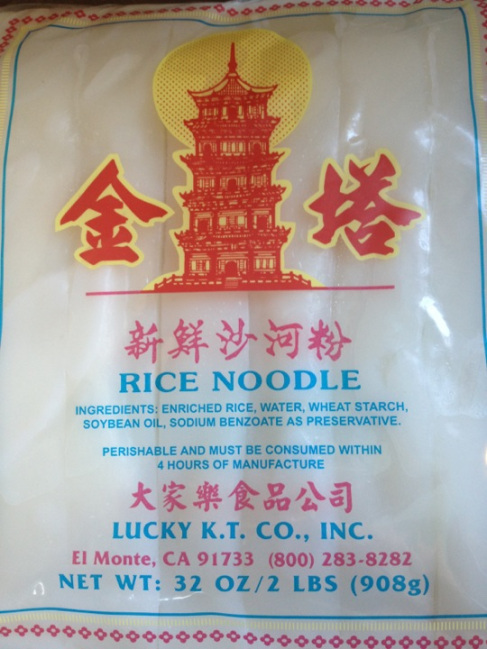 You are looking for noodles that are about 1/2" wide that are rolled together in a package, usually well lubricated with some oil (again, the noodles are super sticky). Usually in the refrigerated section or out at room temperature near the produce. Talk to someone who works at your local asian market and let them know what you're making, I find that most folks are extremely kind and willing to help you find something close to what you need. You can substitute different proteins in this recipe such as pork tenderloin, beef, shrimp, tofu, etc. If you are using an alternate protein, just thin slice (or cube, if using tofu) and toss with the cornstarch and follow the instructions in the same way. If you're using tofu, I would press as much of the rice out as possible and possibly fry in a separate pan so that they don't break into pieces.